One wolf lost his memory, but they’ll both lose their hearts. Bitten werewolf Tom owes the folks at the Dead and Breakfast big for saving his life. So when they ask for help with a rogue wolf on the premises, he’s happy to do his part…. Though he isn’t quite prepared for what he’ll find. Werewolf Nathan lost everything to a sadistic kidnapper—his freedom, his memories, and maybe even his ability to be human. But as soon as he meets Tom, he knows he might be able to reclaim his life. And even a turned wolf like Tom feels the mating call. The trouble is, Tom isn’t the only one who wants Nathan, and they’ll need help from all their supernatural friends at the D & B to defeat a powerful enemy and keep their love—and themselves—alive. Fangs for the Memories is the second book in the Dead and Breakfast series and the thirty-first book in the Dreamspun Beyond series. Ever since reading Fangs and Catnip, the first book in the Dead and Breakfast series, I have eagerly awaited this book since it’s about Tom and his fated mate. We first met Tom in Fangs and Catnip. He was at the Dead and Breakfast Inn because he was a bitten wolf shifter and he was having trouble controlling his shifts. He became fast friends with Carter, a mountain lion shifter, who bounces around like Tigger on crack, Carter’s mate Fallon, who’s a vampire, and Tanner who’s a fierce bear shifter with a mothering streak. When Tanner and Carter notice a rogue wolf on the property, they know that they’ll have to find a way to either get him to move on or he may end up one of their customer’s lunch. They think that maybe another wolf will be able to talk to him and help him so they contact Tom and see if he can come and help. Tom’s wolf loves to play in the snow, and the D & B has just gotten six inches of fresh powder. He also loves to help other shifters like he was helped by the D & B gang. He wasn’t expecting that the rogue wolf would be his mate or that he would be stuck in his wolf form, injured, malnourished, and missing his memories. Luckily for Tom because of the mate bond, they are able to communicate mentally, and he eventually finds out as his mate’s memories come back that his name is Nathan. It’s through the mate bond that Nathan will finally find the courage to shift back into his human form so that he can have a physical relationship with his mate. Nathan lost everything to a sadistic kidnapper, his freedom, his memories, and maybe even his ability to be human. But even stuck in his wolf form he recognizes his mate when Tom comes out in his wolf form to help him. But he’s been a wolf for so long, relying on his wolf’s instincts that it will be quite a while to learn to trust his mate and move in with him and allow him to help him. As his memories come back, he remembers where he was kept captive and that there were other shifters that were in cages with him when he escaped. When he tells the D & B gang, they figure out what kidnapped him and know that it’s only a matter of time before he tracks him down and captures him again. But will the D & B gang be able to defeat this powerful enemy and keep their love, and themselves, alive? I loved reading this book and getting to see the Dead and Breakfast gang again. 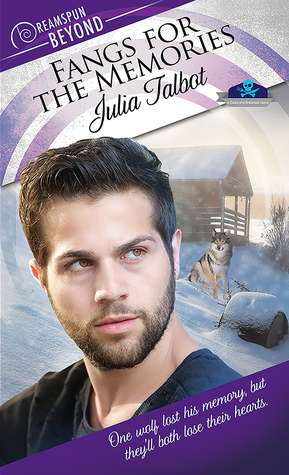 I’m hoping that the next book will be about Tanner finding his mate.